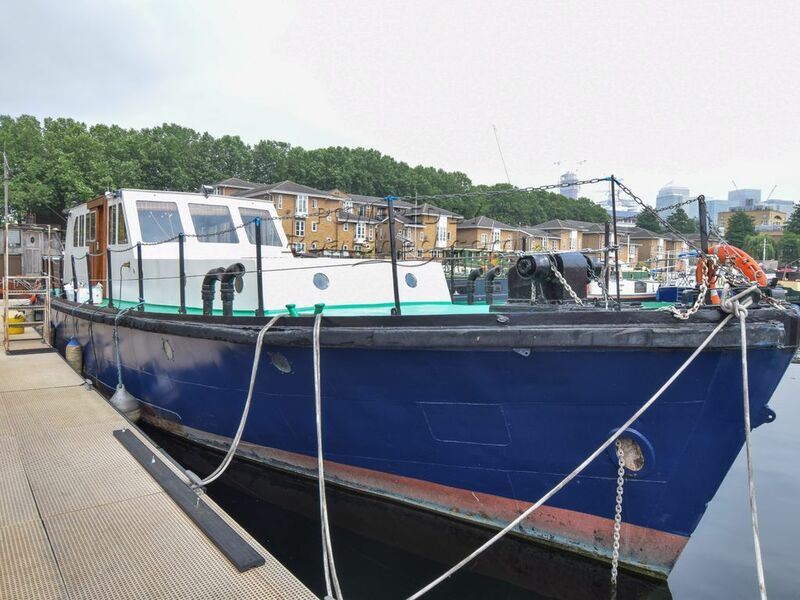 Boatshed London are delighted to offer this impressive Fire Boat which has been converted into a fantastic houseboat, sold with highly desirable residential mooring in Greenland Dock, SE London. The boat was originally built in 1963 and converted around 2000. It offers two cabins with double beds, two bathrooms and a large wheelhouse/living area with views out across the marina on both sides. The large master cabin in the bow has its own ensuite and the massive headroom makes it feel even more spacious. There is plenty of space on deck for sitting outside in the evenings and the exterior in general is in good condition having been recently repainted. The Rolls Royce engines are currently out of commission and the hull is due for lifting and repainting. The residential mooring at Greenland Dock is one of the most sought after in London and is fully transferable. The marina charge a 10% transfer fee to take on the mooring. Current mooring fees are roughly £10,000 p.a. The marina has great transport links with the river bus (2 mins), Surrey Quays (10 mins) and Canada Water (18 mins) all within walking distance. There is also free parking all the way round the marina. This Converted Fire Boat 19m With London Mooring has been personally photographed and viewed by Angus Rose of Boatshed London. Click here for contact details.